The MIS self-tapping Seven Implants are specially designed for implantation in a wide range of bone types and bone augmentation procedures. SEVEN™ is the innovative result of an extensive research and development process, offering a unique combination of surgical and restorative benefits. Drs. Shukla at Applewood Village Dentistry exclusively use the MIS Seven line of implants for our in-house dental implant procedures. 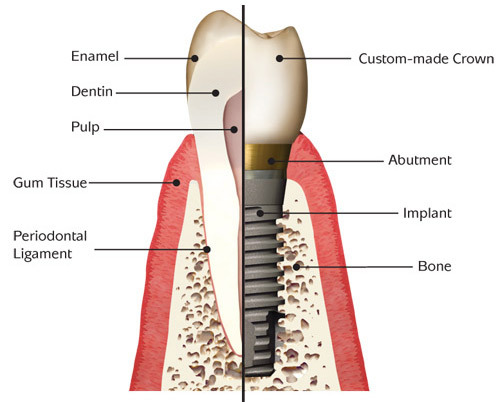 These are a versatile range of dental implants with a high success range and a long track record worldwide. Internal Hexagon Connection: Implementing a perfect fit between the implant and the abutment, minimizing micro-movements and reducing bone resorption. Unique Thread Design: The interior body of the implant is significantly more tapered than its outline. This is achieved by deeper threads at the implant apex, which gradually become shallower towards the neck, resulting in horizontal bone condensing. In addition, the threads are sharper at the apex, gradually lessening towards the neck. The unique thread design provides the implant with high insertion properties as well as vertical condensation of bone. SEVEN features a dual thread which increases the BIC (Bone to Implant Contact) over the entire body of the implant. The Dual thread doubles implant insertion rate (2.40mm), allowing for a simpler and faster implant placement. The SEVEN thread design also contributes to its high initial stability properties. Micro-Rings: At the neck of the SEVEN™ implant, Micro-Rings significantly increase the BIC (Bone to Implant Contact), avoiding bone resorption at the neck. Surface Treatment: SEVEN™ implants are sand-blasted and acid etched. These surface treatments increase the implant surface area by creating both micro and nano-structures and eliminating various surface contaminants. Along with a thorough cleaning process, the acid etching ensures a surface of high quality and purity. The combination of sand-blasting and acid etching has been proven to substantially maximize the BIC (Bone to Implant Contact) in numerous clinical and scientific studies. It also creates osseoconductive morphology, achieving superb osseointegration results compared with other surface treatment methods. Single-use Final Drill: Each and every SEVEN™ implant is packed and supplied with a sterile, single use, stainless-steel final drill. The drill is custom-made, in accordance with the specific geometry and design of the SEVEN implant, achieving an osteotomy that allows perfect positioning of the implant. The final drill offers a simpler, easier and safer procedure; increasing success rates. Call our office today for special savings on MIS Seven dental implants!